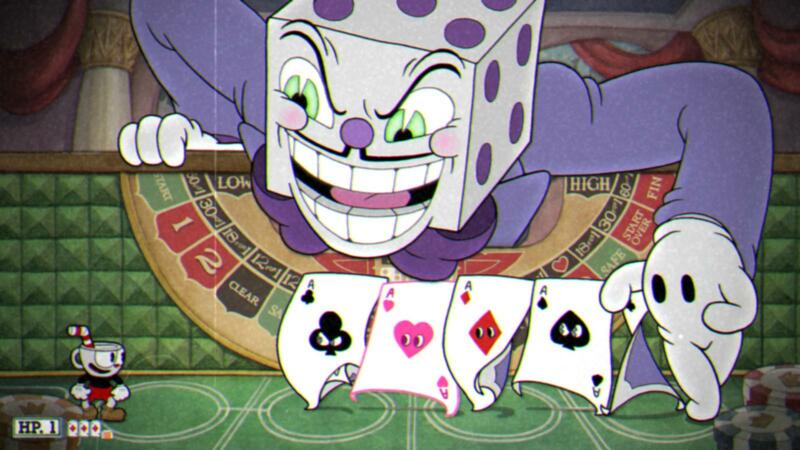 This guide is designed to help players who are struggling to beat King Dice and his minions in "All Bets Are Off!" This is by no means the "best way" to complete this level! I am only suggesting this loadout because I found it easier to defeat the mini-bosses that appear in this stage. Anyway, Charge is a great high-damage weapon that is capable of dealing with enemies in no time. 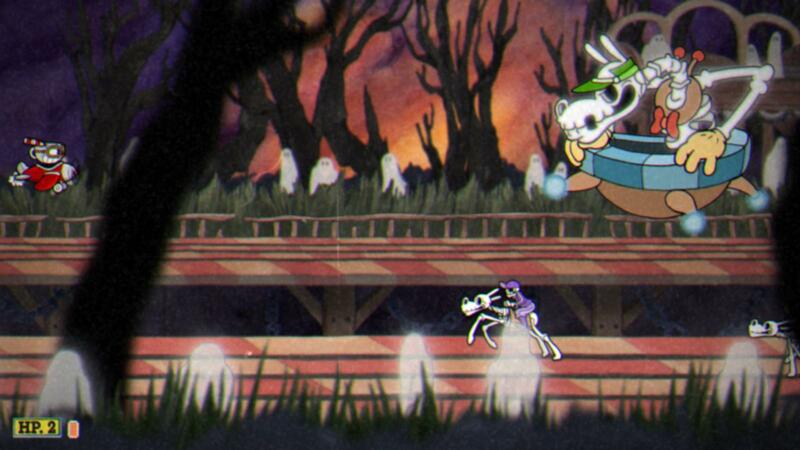 It's EX attack, Radial Barrage should be saved for bosses that cannot directly damage you if they are in the background; for example, King Dice. Spread can deal even more damage than Charge when used in the right scenarios. It's EX attack, Eight Way is very powerful if multiple spikes hit the opponent. Make sure to use Charge as your ranged attack and save Spread for instances where you can get up-close-and-personal with the boss. Next, Energy Beam is extremely powerful and also makes you invincible in its animation. It should also be noted that it is almost always more effective to save up for a super attack rather than spamming EX moves! Use Energy Beam whenever since you're never technically "wasting" it unless you know the boss is about to die. Lastly, Smoke Bomb is a very useful charm when it comes to dodging enemy attacks from most of the mini-bosses. For those who feel attached to the charms Heart and Twin Hearts, don't fret too much about health because you can receive up to 3 extra HP in this level! Also, if you are aiming for an A+ or S Rank, my recommendation is battling Chips Bettigan, Hopus Pocus, and Pirouletta. 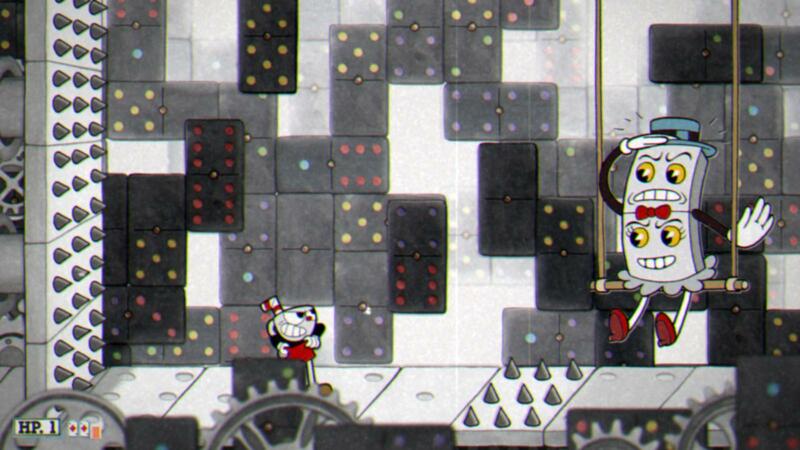 (All three of these bosses are a cake-walk with Smoke Bomb.) Once again, this is by no means the "best way" to complete this level! Well, with all preparations complete, it's time to head into the Devil's Casino! 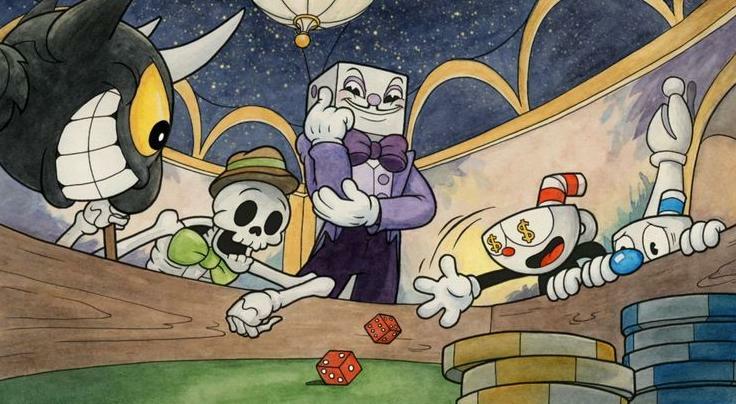 Starting off, King Dice will enter the arena and present the player with a six-sided die. Although this die appears normal, it only cycles through the numbers: 1, 2, and 3 while it spins. The die can be stopped with a parry (obviously, it's bright pink) and will move the arrow on the board game however many spaces you rolled. The red spaces with the numbers represent which boss you will have to fight. The heart above the numbers give you one extra HP, and the green Safe spaces prevent you from having to fight a boss that round! Although, the Start Over space sounds like exactly what it does... Back to the start for you! 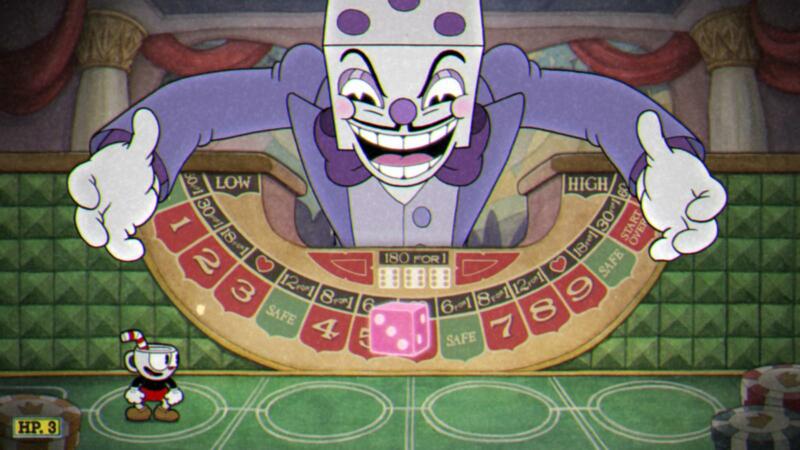 The end goal of King Dice's game is to reach the Fin space on the opposite side of the board. Landing here will begin the fight with King Dice. When given the choice between a Safe space and a heart space, go for the free HP. The best way to time a roll is by jumping at the number before the one you want and then immediately parrying. Try parrying the die while it is above the player's head so all of the numbers are clearly visible. Take your time! There's nothing preventing you from getting that perfect roll! The Tipsy Troop is a trio of alcoholic beverages who are encountered on the red "1" space. This boss is interesting because it has three unique attacks. The whiskey bottle can spew a temporary waterfall of its contents. The martini glass can create small olive bats that will try and launch their eyes at you. And lastly, the shot of rum will spill its contents onto the table. My recommendation is dealing with them in this order: rum, martini, whiskey. 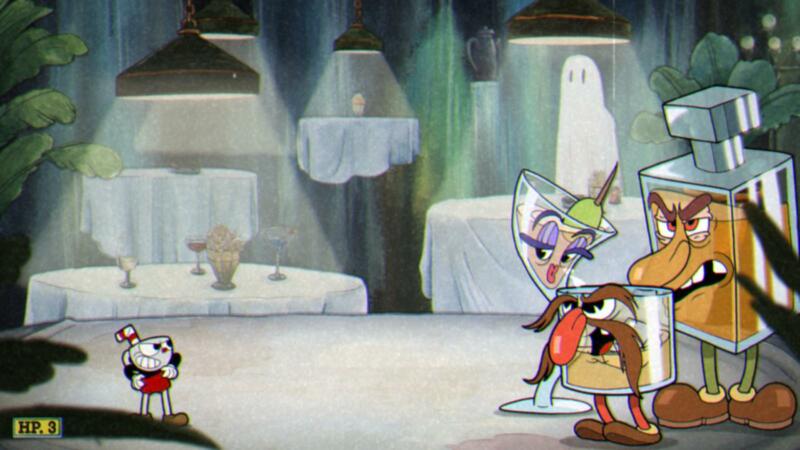 The attack where the shot of rum trips and spills onto the table is very quick and can easily catch players off guard. It also causes you to jump into the air which can then result in being damaged by the olive bats. Play it safe and use Charge on the shot of rum. Once he is defeated move onto the martini glass. Her olive bats can create a stressful environment however they can be easily exterminated with Spread. Again, it's best to use Charge and keep a safe distance. Lastly, the bottle of whiskey. Once his intoxicated allies are out, he should be no problem. Either Charge or Spread works fine against him. Here's a helpful tip! If you get cornered by the whiskey bottle's attack in the earlier parts of the fight, Smoke Bomb right through it! Overall, the Tipsy Troop is probably the most hectic and difficult fight out of mini-bosses 1-3. 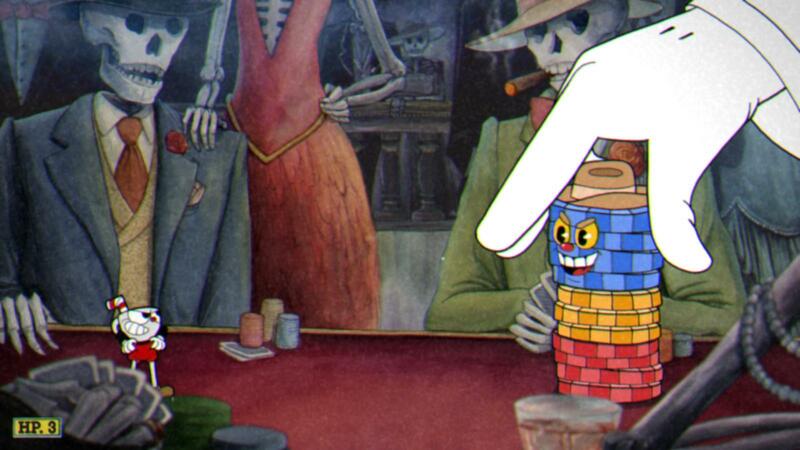 Chips Bettigan is a stack of poker chips who is encountered on the red "2" space. He only has one attack which is splitting into individual chips and then slowly moving across the screen. The order that his chips move towards the player is completely random as well as the number of chips that are grouped together. Once he has made it from right to left, (or vice versa) he will give the player a brief time to attack. Bettigan has one weak-point; the blue chips that make up his head. Now is the time to wail on him using Spread. If you feel like playing a little risky, it is also possible to snipe Bettigan's head using Charge during his attack. Smoke Bomb also comes in handy during the battle. If you have a wall of chips coming at you, Smoke Bomb right on through! The boss will continue to move back and forth until he is defeated. (This should only take a couple of cycles.) Overall, Chips Bettigan is the easiest to handle out of mini-bosses 1-3. Mr. Wheezy is a giant cigar who is encountered on the red "3" space. He has two attacks as well as his minions being the cigarette demons that endless float upwards from the fiery pit between the ashtrays. Wheezy's main attack is spitting one to three fireballs which will slowly spiral towards the player. The best way to avoid these is by hopping over them while they are on their way down. Be careful! The fireballs might hit you in the back while you're busy dealing with the next one. Wheezy's secondary attack is disintegrating into ash when he is finished shooting fire. He will then proceed to transfer to the ashtray you are standing on; forcing you to dash to his ashtray. Having Smoke Bomb is amazing here because it eliminates the threat of those pesky cigarette demons getting in your way! Also, it's pretty much impossible to deal damage with Spread this fight, so just stick to Charge for the whole time. Wheezy will continue to switch ashtrays and spit fireballs until he is knocked out. 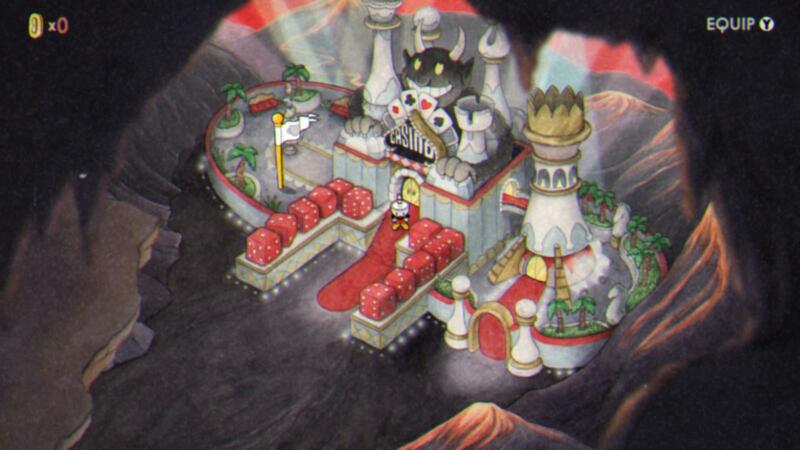 Overall, Mr. Wheezy is a decently hard fight but Smoke Bomb makes it a breeze. 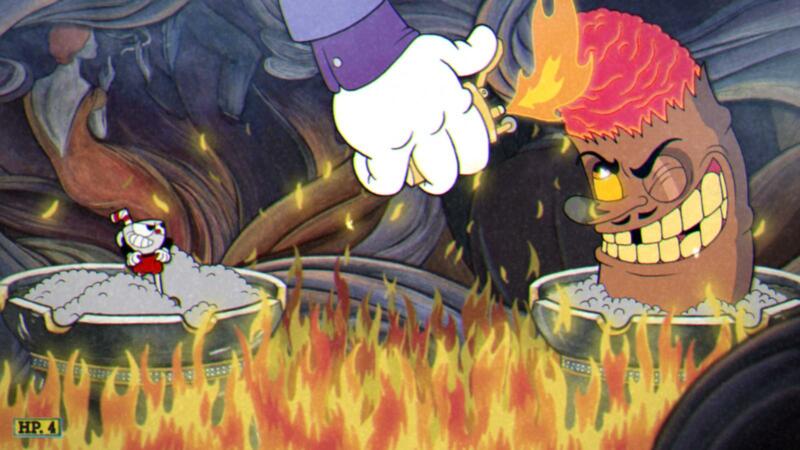 Pip and Dot are a two-faced domino who are encountered on the red "4" space. They have two attacks along with the spiked conveyor belt which is constantly in motion. The first attack is their body launching a multi-colored D20 out of their mouth which ricochets off the walls. They occasionally spit out pink ones which can be parried so make to nab it! 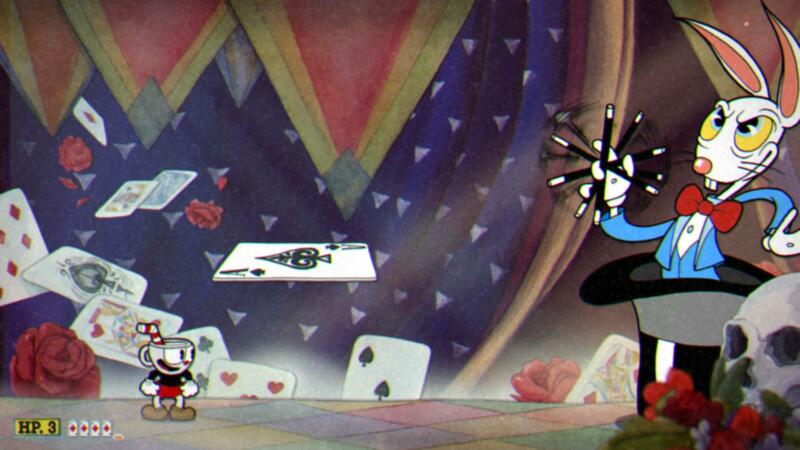 The second attack consists of Pip revealing a domino bird under his top hat. The bird travels around the edges of the screen and eventually makes its way to ground level so take it before it causes trouble. (It has low HP so it shouldn't be a problem against Spread.) As for Pip and Dot, only use Charge because it can be too risky to Spread at close range. Be careful about the moving spikes on the ground and the spike wall on your left! I recommend holding off on dashing because you may over-estimate the distance you travel. Overall, Pip and Dot aren't too bad besides that fact that Smoke Bomb isn't very useful here. Hopus Pocus is a rabbit magician who is encountered on the red "5" space. He has two basic attacks. The first being a spell that causes a line of playing card suits to appear either on the top or bottom of the screen. Dodge this attack by parrying one of the two pink hearts. 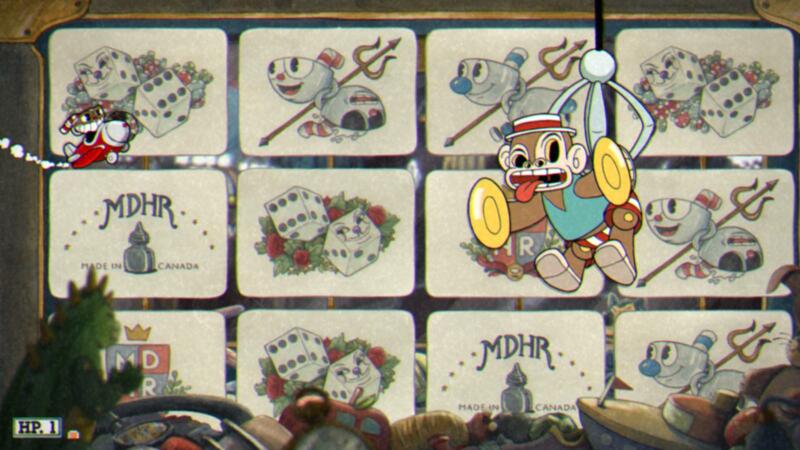 If the suits appear on the bottom of the screen make sure you're on top of the floating playing card. If they appear on the top, stay on the ground to maximize time needed to parry the heart. (Remember, it is much harder to parry something that is moving downwards while also being directly above you.) As for Hopus' second attack, he will create a ring of rabbit skulls with one gap (like the Boo rings in Super Mario World!) that encircles the player no matter where they run. The skulls will eventually move inwards on the player and they will have little time to escape through the gap. Normally, you would stand on the floating card and either jump out through the gap or drop through the card. This can actually be a very difficult attack to avoid but luckily you have Smoke Bomb! As soon as those skulls move in, dash right out of there! For this battle, you should mostly stick to using Charge on Hopus and constantly be standing on the platform. Overall, Hopus can be a tricky fight but Smoke Bomb makes it super simple. Definitely the easiest out of mini-bosses 4-6. Phear Lap is a skeletal horse who is encountered on the red "6" space. He only has one main attack along with the blue ghouls that will spring upwards from their horse. Phear Lap launches a present from his rib cage which then explodes into eight golden horseshoes. One of these will always be pink so trying shrinking down and quickly parrying it before it flies away. Honestly, one of the hardest parts of this battle is the blue ghouls. They will only spring up when they are directly below you so shrink out of the way because they move fast! Use your plane's Peashooter when in the back and Mini-Bomb when at close range. (Blah, blah, blah you've heard it all before.) Although watch out for the gift boxes and ghouls while using Mini-Bomb. 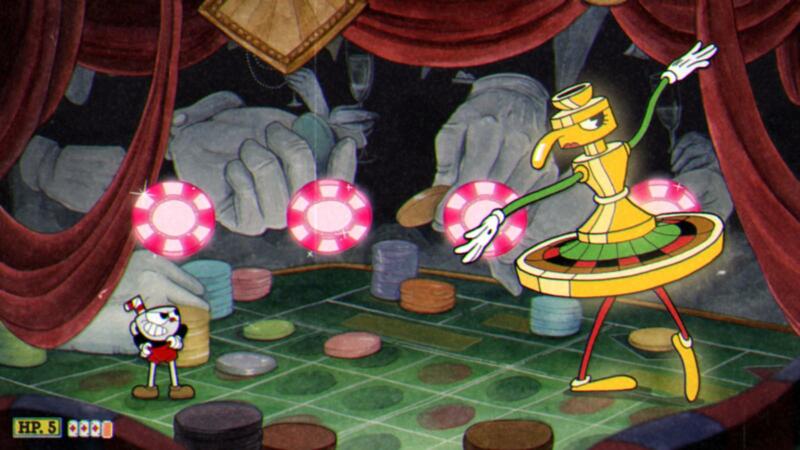 It's probably just a safer choice to stick with Peashooter this fight. Overall, Phear Lap is the most difficult out of mini-bosses 4-6 due to his unexpected attacks. Pirouletta is a ballerina resembling a roulette table who is encountered on the red "7" space. She has two attacks along with four parryable casino chips above. The first attack has Pirouletta dancing across the screen back and forth very quickly. Normally this can be ridiculously hard to avoid using the chips, but luckily we have Smoke Bomb! As she is moving in your direction, dash on through, and if you have the chance, try getting in a couple shots with Spread. Because of this, it's best to ignore the parryable chips entirely. The second attack has Pirouletta launching white balls into the air which rain down on the player. There will be a small gap in the avalanche of balls, but this isn't even a concern with Smoke Bomb. While you escape early from this attack, now is your chance to go crazy with Spread. For the entire fight, I recommend using Spread due to Pirouletta's large hitbox. Overall, Pirouletta is the easiest out of mini-bosses 7-9 because of Smoke Bomb's versatility. 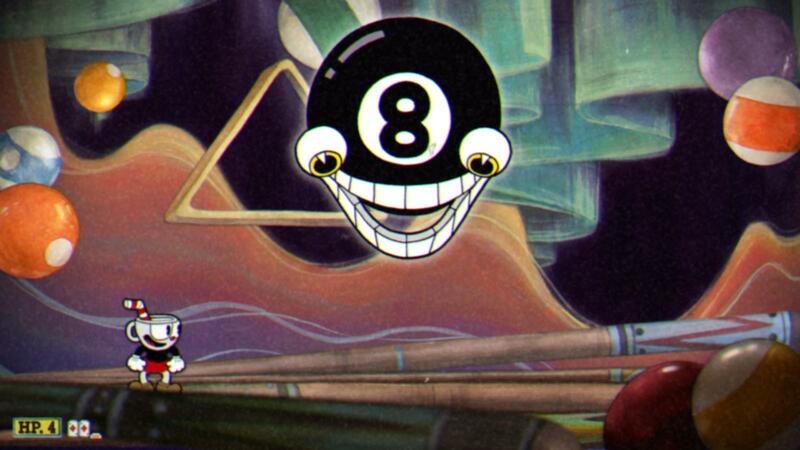 Mangosteen is a massive floating 8-ball who is encountered on the red "8" space. It has one main attack along with the multitude of their pool cue chalk army. Mangosteen's only attack is charging up a small rainbow-colored ball of light and then firing it towards the player. The tricky part about this fight comes from the chalk enemies who will try to crush the player. There are three different color variants of this minion: the orange chalk jumping the least distance, the green chalk jumping the greatest distance, and the blue chalk jumping a medium distance. These enemies are unkillable, and they will spawn on either the left or right side of the screen and continue jumping in one direction until they reach the other side. There can only be a maximum of two of the chalks moving around the screen at once. Stay towards the middle of the battlefield, reducing the chances of being unexpectedly hit by Mangosteen's minions, and shoot upwards at the boss with Spread. If the chalks force you to the other sides of the screen, switch to Charge and snipe Mangosteen at a distance. Also, if you happen to be in a tight situation, Smoke Bomb your way through. Overall, Mangosteen is not a terribly hard fight due to their limited movement and attacks. Mr. Chimes is a cymbal-banging toy monkey who is encountered on the red "9" space. He has one main attack along with a mind-bending memorization mini-game. (Try saying that five times fast!) Mr. Chimes is a unique one. You will immediately notice the card-matching memory game that takes place in the background of this fight. 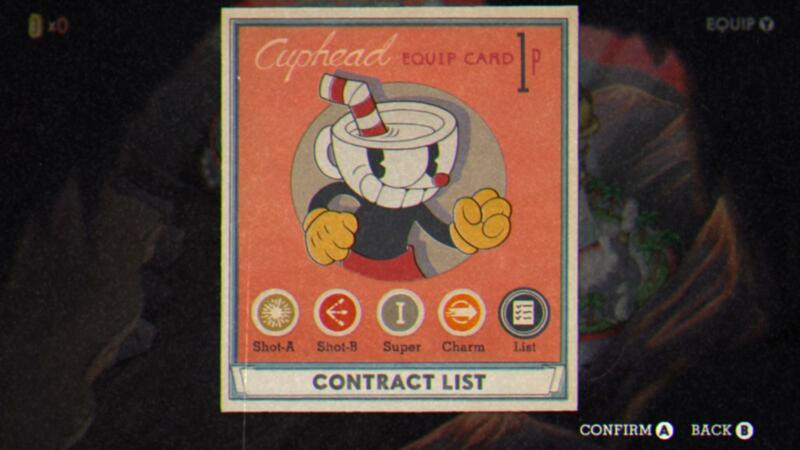 The parryable cards will only be visible at the very beginning of the fight for a brief moment, so pay close attention! (Here's a tip! If you want to be really sneaky, then take a picture using your phone to cheat your way through the main gimmick of the fight!) There are six matches that need to be made in order to defeat Mr. Chimes. The monkey will endlessly ricochet off of the walls like a DVD logo bouncing off the sides of a TV. After a match has been made, the monkey will wake from his slumber and become vulnerable to your attacks. If you fail to make a match, Mr. Chimes will only move faster around the screen. His only attack consists of crashing his cymbals to create six music notes in a hexagonal fashion. During this phase, Mr. Chimes will continue ricocheting off the walls, and when he is damaged enough, the card-matching mini-game will resume. Here are all of my suggestions regarding the fight. Take priority of your Mini-Bombs because it can be difficult to hit the boss with Peashooter. Utilize your ability to shrink and quickly move out of the way of the boss. And finally, save your special until you are cornered. If you feel like you are about to take damage and your special is ready, use it to escape a tight situation. Just remember that Mr. Chimes is immune to all attacks until you create a match. Overall, Mr. Chimes is the most frustrating and difficult out of mini-bosses 7-9 because of his unique battle. If you'd like to view a video of all ten casino bosses, "Boss Fight Database" has you covered!